Having grown up in Colorado, I was very familiar with the quality of the plateau and the history of big bucks and bulls that have come from it over the past forty years. It is one of the most sought-after units in the state of Colorado for big bull elk as well as mule deer. One of these premium elk tags is going to require roughly two decades of accumulated preference points to get to play the game during one of the open seasons. Deer won’t take as many, but you are still going to spend at least a decade as a nonresident to get a chance to hunt. Having not been in the unit in over a decade, but knowing the history, I invested in a 2nd season deer landowner voucher and coaxed a good buddy into doing the same. I scouted heavily on this drought year and was turning up a whole lot of nothing. By the time the season arrived, I had exactly no contender bucks and by the last weekend of the season, I had only seen one giant buck. It was in the back of a truck. I felt that I was pretty good at getting things done in an unfamiliar area, and I don’t mind a piece of humble pie every now and then, but eating the whole pie wasn’t something I was used to. I started making phone calls and visiting taxidermists, meat processors, and even calling outfitters with a few days left to at least help my buddy fill his tag. The name of JT Robbins of Allout Guiding & Outfitting kept coming up as a go-to guy for someone who knows the area and consistently delivers success to his clients. However, I didn’t connect with him while we were still in the unit and I ended up eating my tag. JT reached out to me soon after the hunt ended and shared some great pictures of successful clients. He said that he would be busy finishing the elk season and then would be onto cats as soon as 4th season was over and wanted to talk when he got a decent break. Since we are always looking to pair ourselves with the best outfitters in the business, I was open to the conversation whenever he was available. For the next 8 weeks, every time I had a text from JT it was another huge cat either in a tree or being held by a successful client. By the time we got to speak about working together, he had successfully harvested twenty big cats out of both Colorado and Utah. This is a level of success that I’m not familiar with and he does it nearly every single year. JT informed me that our hunt in unit 61 was very similar for those guys for deer, but the elk is where things are at. Big bulls and cats are truly his passion and after the results he had posted from the past few months, I knew that Allout Guiding & Outfitting was someone we wanted to work with in the future for our Pro Membership Sweepstakes, as well as booking those hunters who have spent decades building points. We made arrangements to tag along for a spring bear hunt in Utah as well as do a late season bull elk hunt for the next season. The spring bear for my good buddy Dave Bloom was a success and I got to see how JT and his team worked together and it made me even more excited to get to unit 61 for the fourth season elk hunt. While the hunting conditions were typical, the accommodations at the Gateway Canyons Resort and Spa were anything but. We arrived at Gateway Canyons Resort and Spa in Gateway, Colorado to start our elk hunt in mid-November. This made for more of a luxury getaway than the base camp for an elk hunt. However, after living in tent camps and freezing for the past few weeks, this was going to be a very welcome experience. This five-star resort is a bustling metropolis during the summer and early fall, but they had limited guests during this later November hunt. But they still offered fine dining each and every evening. JT and his crew met up with us at the resort the night before the season to enjoy a great meal and go over the plan for the week. They would pick us up early in the morning and we would head up the mountain and spend the day hunting and wouldn’t be back until after legal shooting light was over or we had been successful. My great friend and taxidermist Buddy Adamic from Canon City, Colorado was the tag holder and he had burned 14 preference points for this 4th season tag and he only needed 9, so he was taking one for the team for us to do this evaluation trip. However, Buddy had never harvested a bull over 300” B&C and JT said we would be looking for a bull well over that threshold. JT tries to target bulls that are 330” B&C and bigger in this unit, but the weather, moisture levels, and physical abilities of the hunters all play a factor in what they tag out with. Buddy enjoying the view of the sunrise over the Uncompahgre Plateau. Opening morning had us sneaking into a spot where both JT and Scott Kent, (AKA: Clark Kent) our guide had seen a bachelor herd of bulls, which had several bulls we could shoot. We had started walking to the area the bulls had been frequenting and JT was on a lookout point observing the situation. He had another young guide by the name of Skyler looking for "Plan B” bulls if our morning plan didn’t work out. As the sky started to lighten in the east, we got a signal from JT that the bulls were exactly where we wanted them. They were in perfect position for a play. An opening morning harvest would be something I’m not very familiar with but having someone who runs cats in the area as well as knows the habits of his animals is why this is possible. We slowly moved through the thick brush looking for a window to see the herd of bulls. We took nearly an hour to go less than two hundred yards as we slowly picked our way through the brush. We were sure that we hadn’t spooked the bulls, but hunting public ground has its’ disadvantages. A cow elk hunter was wandering aimlessly through the area and came out up wind of the bulls and they all spooked. Onto plan B. By the end of the first day, we had looked at over 60 bulls and a couple in that 330” range, but no real shot opportunities at high quality bulls. Another successful lion hunter with Allout Guiding and Outfitting. Day two we were right back on the same plan. JT felt that there were so many good bulls right here that it would pay dividends if we did our time. He was right with his assessment and the big bachelor group was right back where they had been spooked the morning before. We had come in a different way today and put us right on the edge of the opening and we were here in plenty of time to wait for the bulls to come to us. The wind was good, and the elk needed to come about a half-mile, and they would be in our lap. Unfortunately, another hunter spooked the herd and didn’t even know they were there. We just weren’t getting the break that we needed even though we were into the elk that we wanted. We snuck in on a bull that looked to be a shooter on the 4th day. JT had found him bedded in a thick nasty basin loaded with oak brush. We moved around to where we would be right over the top of him, looking down into his bedroom. If we could find him, we would only have a couple of hundred-yard shot. It took nearly an hour of looking to turn him up and it was too late. He had already gotten our scent and was looking up the hill right at us. We could see his big sweeping beam and huge front end. He was just the kind of bull we were looking for, but we couldn’t see any of his vitals. He was planning his escape and when he finally made the decision to go, he was covering ground in a hurry and only showing us brief glimpses of his huge antlers. He stopped for just a second at over 800 yards and we could see that he had broken his main beam just above his G3 on his right side. What a beast of a bull, but so sad that he had lost so much of his right side. With only one day left on this five-day hunt, I was feeling like this is more of what I’m used to. However, we were getting to look at a lot of elk and really seeing what JT and his team were made of. The optimism was high, and we knew we were in the right place. We just needed a break and Skyler provided it. He left hours before daylight to hike up to a huge overlook. He had found the bachelor herd of bulls that had disappeared on day 2 and they were a couple of miles away, but in a very killable spot. Dave Bloom of California teams up with JT Robbins for another successful spring bear hunt in Utah using some world class dogs. By the time we got to where he had last seen the bulls head into the canyon, JT spotted the whole herd moving towards the top. The oak brush and other trees made getting a clear opening very difficult and the elk were definitely pushing Buddy’s comfortable effective range. We didn’t know if they had spooked or were just going somewhere. The broken main beam bull had joined this group as well and he was the first one to come out of the thickest cover. Buddy had settled in on a big boulder and was tracking the bulls. The perfect 6X6 with curved main beams was going to come out right where the broken beam bull had appeared, and I rattled off the corrected yardage. He stopped in the opening as if on cue and Buddy sent a round from his Browning X-Bolt .26 Nosler downrange and it just went under the kill zone. In all the excitement, Buddy didn’t hear me say the corrected yardage from the bulls moving up the hill. He got the corrected data as I yelled it out again and made adjustments. Now he was a little rattled that the elk were moving. He got back into the scope and his bull and the broken beam bull hadn’t moved. Standing nearly twenty yards apart, I watched the broken beam bull crumble with the report of the rifle. From Buddy’s angle, he couldn’t see the broken beam and the front end and unbroken side isn’t something that anyone would likely pass. The .26 Nosler had hit this bull like a freight train at 900 yards and knocked it off of its feet and crushed him. Fourteen years of waiting to harvest a big bull had come to an end. All that was left was to cross the nasty deep canyon and tag his prize. Buddy Adamic of Big Timber South Taxidermy harvests a great bull. Scott made a beeline to the bull as soon as it hit the ground, but it took the rest of us well over an hour and a half to cross the canyon and get to the bull. Scott assured us that we wouldn’t be disappointed in the caliber of this bull when we finally got up to it. He was absolutely right. This was a very old and mature bull with massive beams. It’s hard to believe that another bull was able to snap this off during the rut. Even though Buddy is a great taxidermist and could fix this bull to its original form, he said that he will leave the broken antler the way it is. 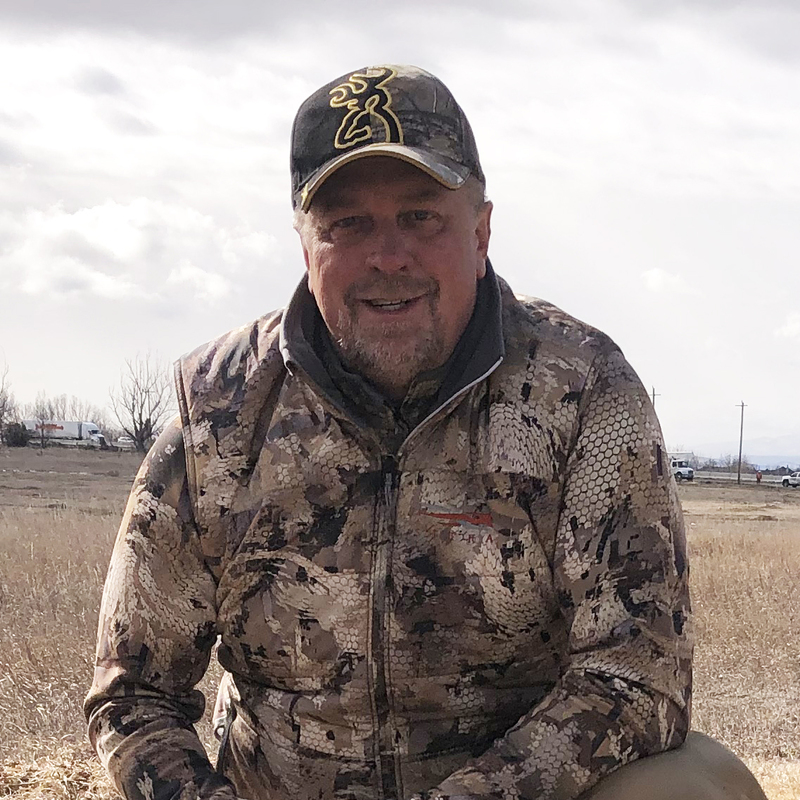 It says a lot about the bull and reminds him of a world class experience he got to have on the Uncompahgre Plateau and with JT Robbins Allout Guiding and Outfitting. Allout Guiding and Outfitting provides hunts in units 61 and 62 as well as unit 40 with high success rates. He also offers limited mountain lion and bear hunts in both Utah and Colorado. I am the President of Sportsman's News. I spent 8 years of my life serving as a United States Marine. I departed the Marine Corps in 1993 and moved to Las Vegas, Nevada. I established a place in the community as a mortgage banker and met my lovely wife Lisa. We built a great family with 3 lovely daughters and in 2003 we relocated to southern Utah. In 2004 I started Sportsman''s News out of my love and passion for the outdoors as well as the desire to share our passion with others. Being able to enjoy your passion as a job is truly priceless.